Dollars Locked With Chain Crisis PowerPoint Templates And PowerPoint Themes 1012-"Microsoft Powerpoint Templates and Background with dollars chained and locked"-Dollars Locked With Chain Crisis PowerPoint Templates And PowerPoint Themes 1012-This PowerPoint template can be used for presentations relating to-"Dollars chained and locked, money, finance, business, security, chains" Our Dollars Locked With Chain Crisis PowerPoint Templates And PowerPoint Themes 1012 allow you to enter any arena. They effectively equip you for the event. Add class with our Dollars Locked With Chain Crisis PowerPoint Templates And PowerPoint Themes 1012. You will come out on top. Dollars Locked With Chain Dollar PowerPoint Templates And PowerPoint Themes 1012-"Microsoft Powerpoint Templates and Background with dollars chained and locked"-Dollars Locked With Chain Dollar PowerPoint Templates And PowerPoint Themes 1012-This PowerPoint template can be used for presentations relating to-"Dollars chained and locked, business, security, finance, money, chains" Conquer fatigue with our Dollars Locked With Chain Dollar PowerPoint Templates And PowerPoint Themes 1012. They are like a deep breath. Put your customer in the spotlight with your thoughts. 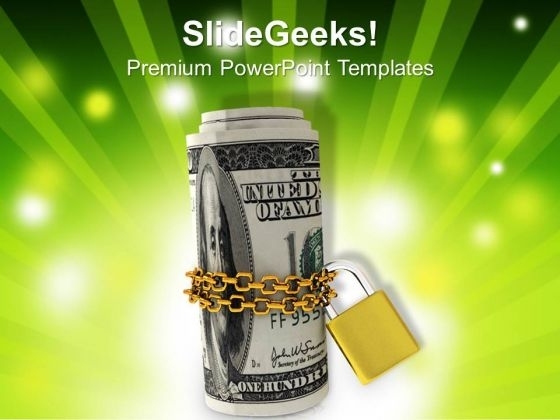 Centre it on him with our Dollars Locked With Chain Dollar PowerPoint Templates And PowerPoint Themes 1012. 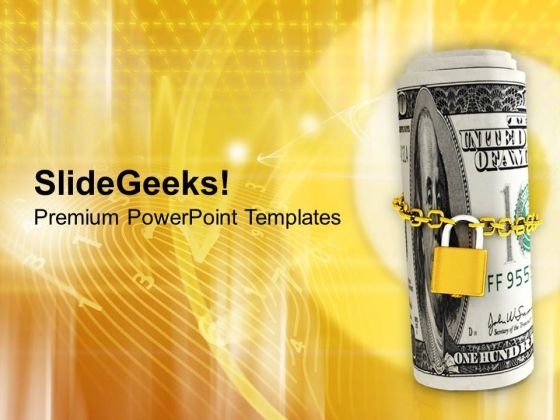 Dollars With Lock And Chain Money Investment PowerPoint Templates And PowerPoint Themes 1012-Create dynamic Microsoft office PPT Presentations with our professional templates containing a graphic of dollars with lock and chain. This image signifies the concept of data security and money investment. This image has been conceived to enable you to emphatically communicate your ideas in your Business and Financial PPT presentations on finance, protection and banking. Our PPT images are so perfectly designed that it reveals the very basis of our PPT template to make your clients understand.-Dollars With Lock And Chain Money Investment PowerPoint Templates And PowerPoint Themes 1012-This PowerPoint template can be used for presentations relating to-"Dollars chained and locked, business, security, finance, money, chains" Buzz the right word with our Dollars With Lock And Chain Money Investment PowerPoint Templates And PowerPoint Themes 1012. You will come out on top. Our Dollars With Lock And Chain Money Investment PowerPoint Templates And PowerPoint Themes 1012 believe in brevity. Do a lot with least possible effort. We present our Business Finance Security PowerPoint Templates And PowerPoint Themes 1112.Use our Security PowerPoint Templates because,Explain the process by which you intend to right it. Use our Chains PowerPoint Templates because, Enlighten them with your brilliant understanding of mental health. Use our Money PowerPoint Templates because, Business Process Design:- The template offers an excellent background to build up the various stages of your business process. Use our Finance PowerPoint Templates because, They are logical, accurate and to the point. 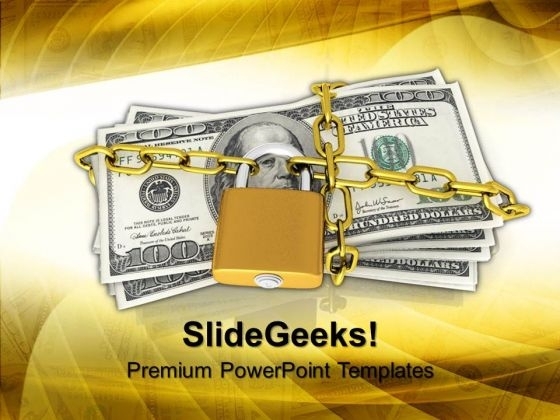 Use our Business PowerPoint Templates because, Brilliant ideas popping up all over the place.Use these PowerPoint slides for presentations relating to "Dollars chained and locked, money, finance, business, security, chains" . The prominent colors used in the PowerPoint template are Yellow, Black, White Make your brainstorming effective with our Business Finance Security PowerPoint Templates And PowerPoint Themes 1112. Churn out ideas to act upon. Our Business Finance Security PowerPoint Templates And PowerPoint Themes 1112 are great elevators. They will lift the levels of enthusiasm with ease.